Standing left is my Mother, Polly Clark. Next to her is Jean Ross and in the same row 2nd right is Barbara Clark. I cannot place any others. My parents lived in Outram Street and my father was Sam Clark. Both my parents did voluntary for the Red Cross. They used to take the children with learning difficulties from Invergordon and surrounding areas to the Maryburgh centre. They enjoyed this very much. They were fortunate to enjoy almost 65 years of married life before my Father died in 1987. The lady on the left of the picture on the back row is Leanora Geddes and the ladies standing in the middle behind the front row are Betty Simpson(? ), to the left of the picture - my late mum is standing beside Betty with her arms folded in front, and Agnes Ross. The gentleman at the back on the far right is Dodd(?) Ross. The picture has brought back many fond memories for me which I had temporary put to the back of my mind! I particularly remember that my mum and the other members use to meet once a week and also attended local events in the area to support the organisers with any bleeding noses etc. I also remember that they use to compete against other groups in the area and I'm sure that on at least one occasion they came home with the cup! I'm sure Jet is right, the lady in the checked suit worked in the Little Shop which is where DE shoes is now; it was owned by Mrs Ross Mackenzie, Saltburn Road I think. It had a great stock of knitting wools I remember. Another lady worked there too and I think her daughter(?) married Kenny Maclean (Diana's son) and they emigrated to Australia. Kenny and my uncle Iain Askew were great mates as teenagers. Bella Ross, 1st left on front row; Elizabeth Munro (Gospel Press) 2nd left front row; Merrit Ross 1st right of front row. Judging by the age of Elizabeth Munro, the picture must be from the mid 70s. My Mother, Nanna Ross told me the lady in the checked suit is Mary Wattie. She ran the haberdashery shop and she lived in the Joss Street area. This picture must have been taken in the mid 70s as Elizabeth Munro, who is now 47, was a teenager and still in school at his time. In the picture is also Leanora Geddess, Evelen Finlayson and I think Betty Wilson. 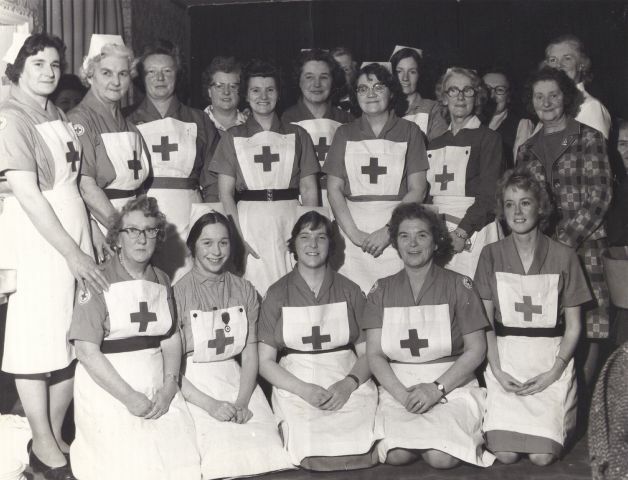 My dad was also in the Red Cross in Invergordon; his name was George Ross (Dodie).